Writing is addictive! Once I started one post yesterday, all I could think this morning at my office was writing part 2 of my trip! Yes, sharing my experience is as exciting as planning and the trip itself! 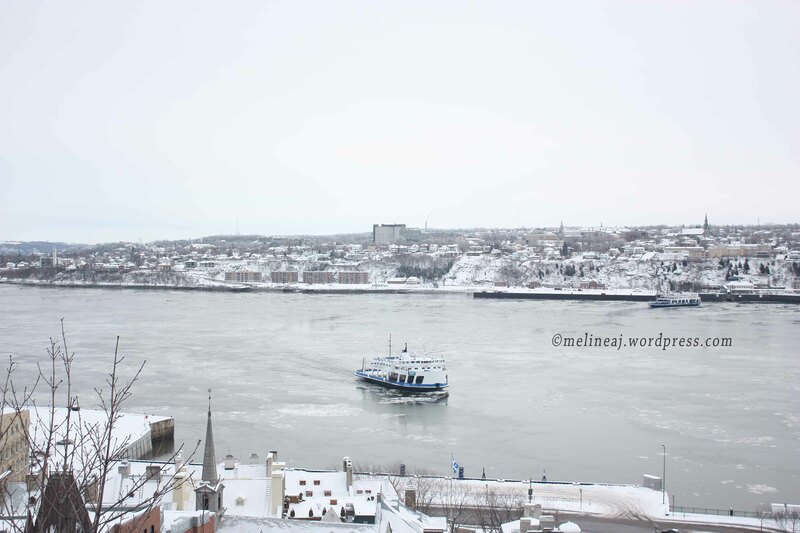 And I genuinely hope, I can help other travelers out there to explore the cities 🙂 So, here is my journey in Quebec City on the second day, which was happened to be Christmas day! What could be more perfect than waking up on Christmas day and looking outside the window where all the grounds were white! YES! I was having a PERFECT WHITE CHRISTMAS! 😀 We had a quick continental breakfast in the hotel since it was included when we booked our room. Then, we walked toward Old Quebec. 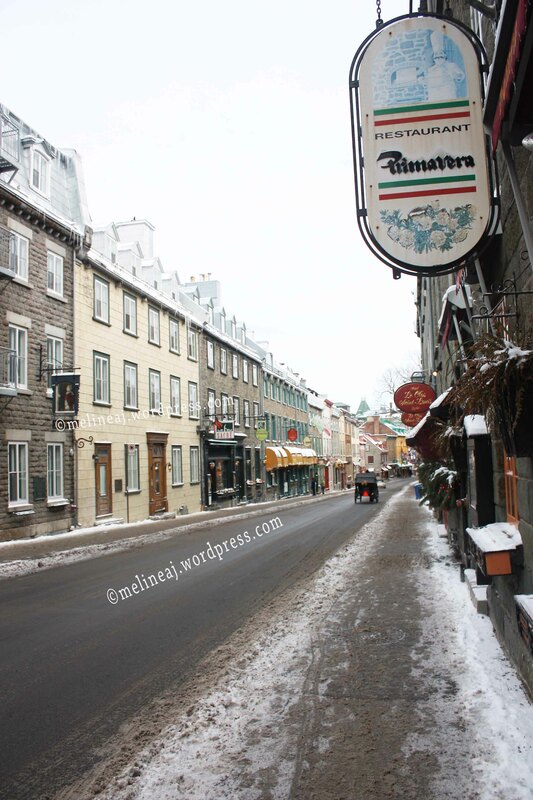 Although the map showed that Old Quebec was a bit far from our hotel, we enjoyed the walk along Rue St. Louis. (Because I took lots lots and lots of pictures hahaha… and plus the white snow made the picture looked so bright and fresh!). The houses and restaurants along this street had rustic style with stones wall – which I LOVE! It felt like we were in Europe! The funny thing that my brother noticed was that some of the duplex house has “1/2” in its number! Just like in Harry Potter – remember Platform 9 3/4 ?! Passing Consulate General de France building, we arrived at the intersection of Rue St. Louis and Rue des Carrieres where Fairmont-Le Chateau de Frontenac was on our right. 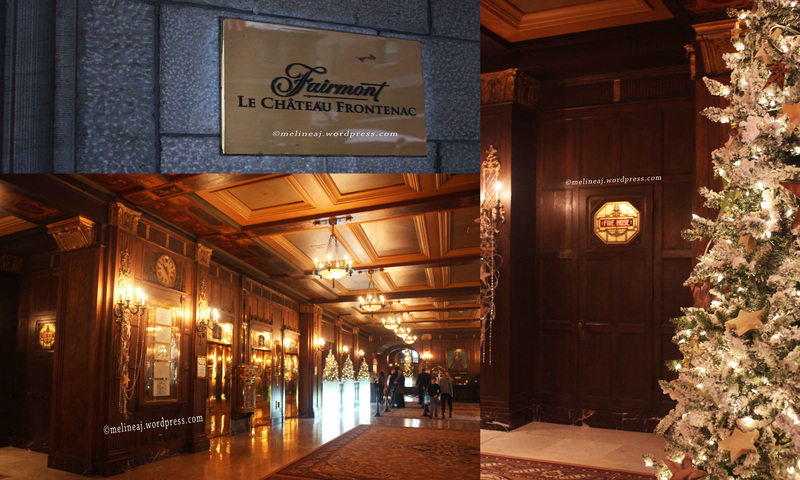 This hotel is one of Quebec City landmarks and it has the pretties view overlooking the Saint Lawrence river. We decided to look inside and as soon as I walked into the lobby, I fell in love with it – unfortunately, we couldn’t afford to spend our money to stay at this nice hotel 😦 or maybe one day we will hahaha… The hotel lobby was decorated with dark wood wall and there were lots of chandeliers at the ceiling. It was so warm and inviting, yet it felt so luxurious. What made it prettier was the Christmas decoration: trees, lights, wreaths. You can actually have a guided tour of the hotel at certain time for $9.50 (adult) but we didn’t join the tour; check out this website for rates & schedules. 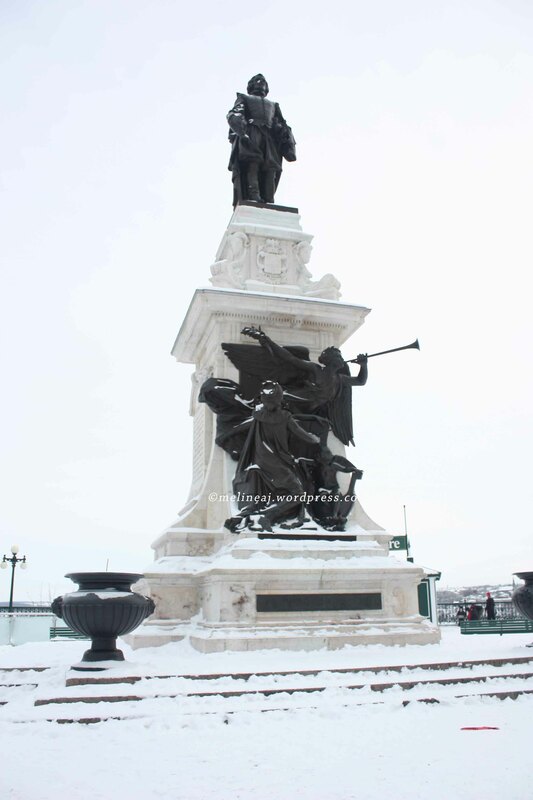 Outside the Fairmont, there is a statue of Samuel de Champlain, the founder of Quebec City. The statue looked so pretty in contrast to the white snow covering it. 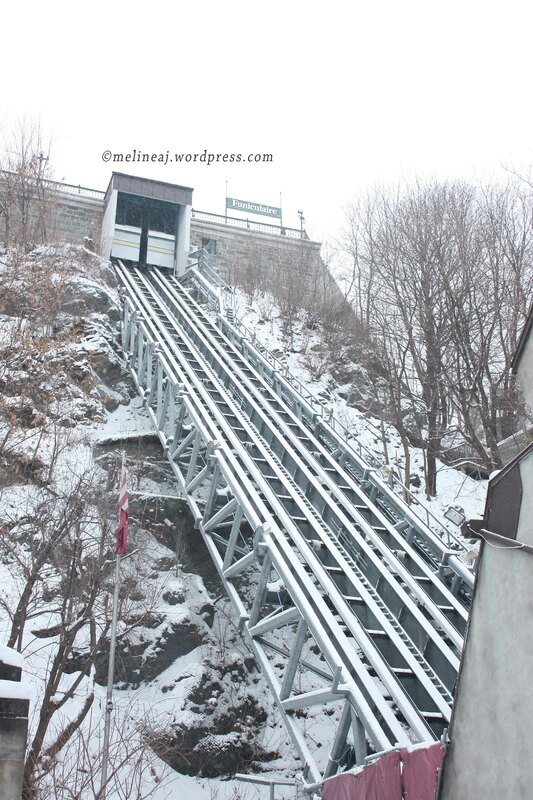 Right behind it is Old Quebec Funicular. The funicular is a slanted elevator that connects Haute-Ville (Upper Town) to the Basse-Ville (Lower Town) (wikipedia). 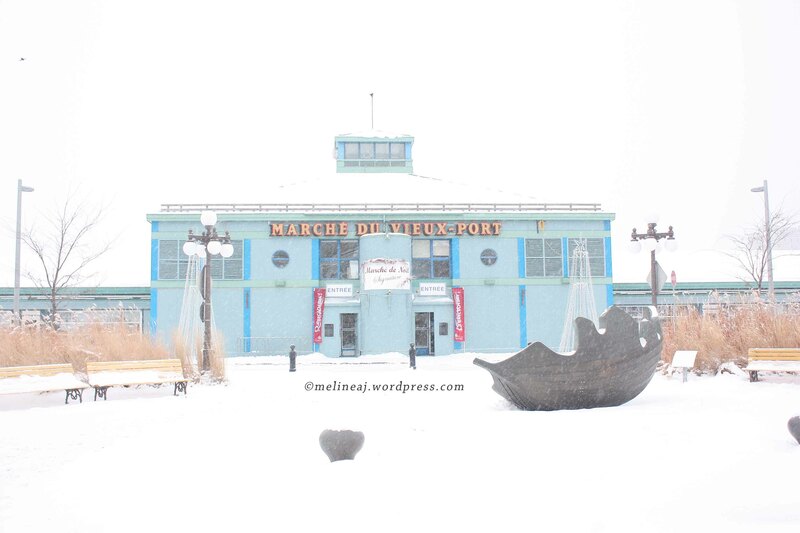 Once you arrive at the Lower Town, you are already at the famous Petit Champlain area where lots of unique stores and restaurants are. 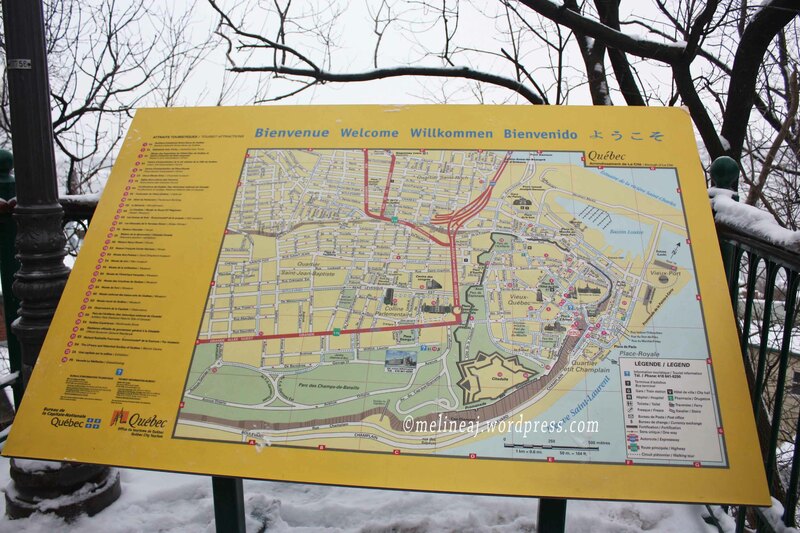 Unfortunately, the funicular was closed on Christmas day – are you seeing a “pattern” here? During our trip, some of the attractions and restaurants that we wanted to go or try were closed! I guess traveling during Christmas was not a good time, eh?! 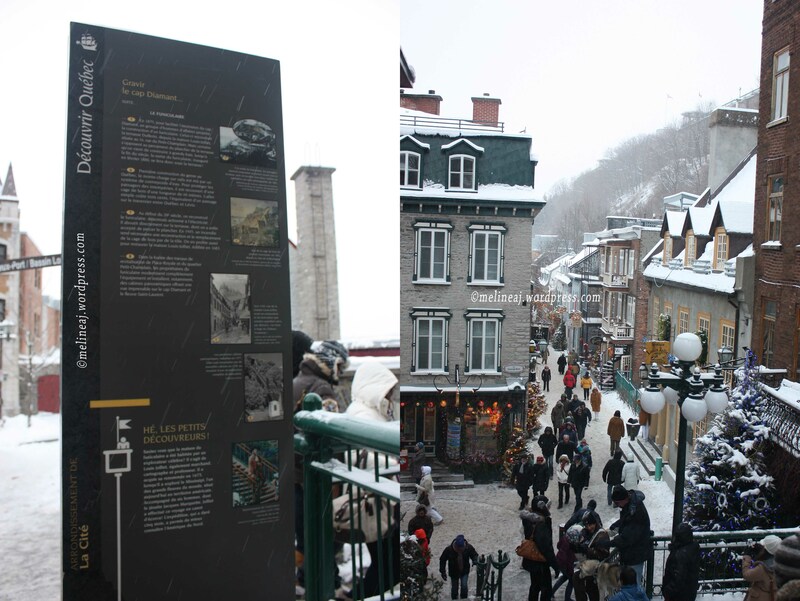 Another way to get to the Lower Town is through a stairs located to the left of the Funicular. It is a bit hidden but try to find a yellow map at the top of the stairs. Once you are at the bottom of the stairs, turn to the right where there are some shops and follow the road until you find the Breakneck Stairs. This oldest stairways with 59 steps was built in 1635! 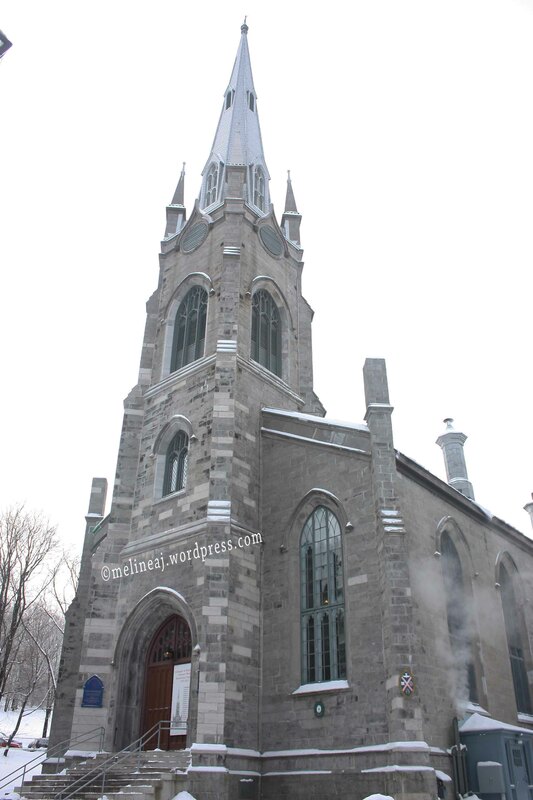 It is the iconic picture spot for tourist since it overlooks the pretty Petit Champlain area. 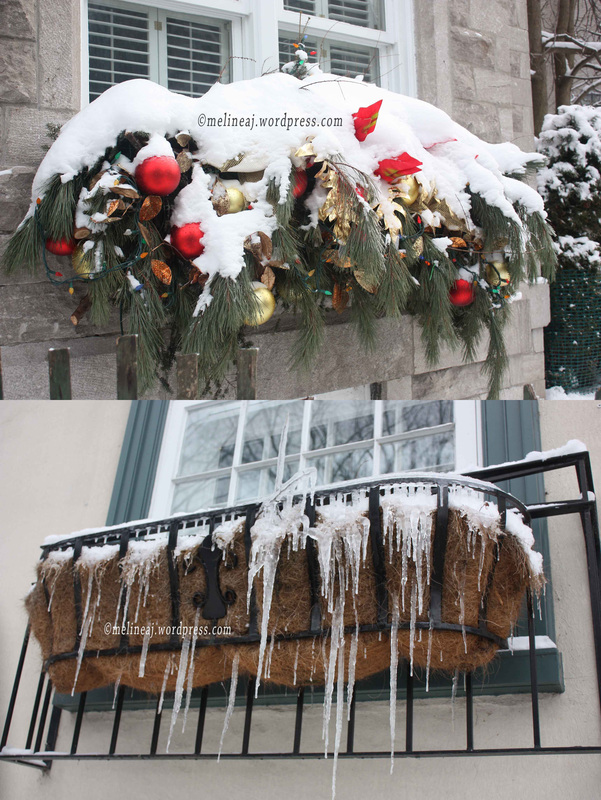 L: The street near Quebec Tourism information; R: look at those snow & icicles! It was almost lunch time and we were super hungry from the cold weather. So, we walked along Rue Saint-Jean to find any restaurant that opened. We saw Le Casse Crepe Breton and it wasn’t that crowded so we decided to went in. 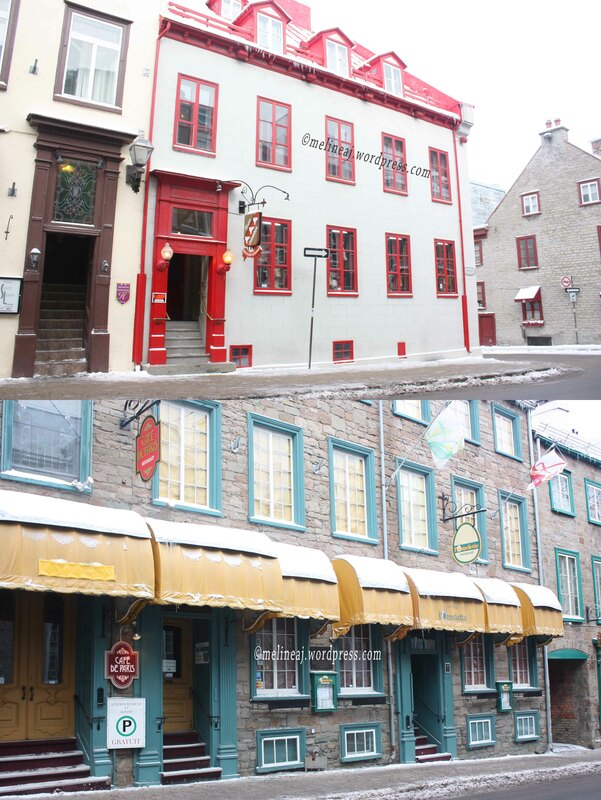 Little did we know, it was actually a popular restaurant in Old Quebec. While we were waiting, the line-ups began. Coincidentally, we met our friend from Vancouver here! So, they joined us for lunch. However, the wait seemed like f-o-r-e-v-e-r! I know that the restaurant only has couple tables but the servers were just very slow. They seemed to take their time to clean and prepare the tables for the guests. Since my friend convinced me that the restaurant was one of the recommended ones, we patiently waited. After about 40 minutes, we finally seated but we had to wait for another 8-10 minutes to order our food *even when we told the waitress that we were ready to order, the waitress said that she was still busy and kept us waiting* The price of the crepe was very cheap in my opinion – around $5-6. I ordered sweet crepe: Pomme et Suisse (Apple and Swiss cheese) and my fiancee & brother ordered the savory crepes. 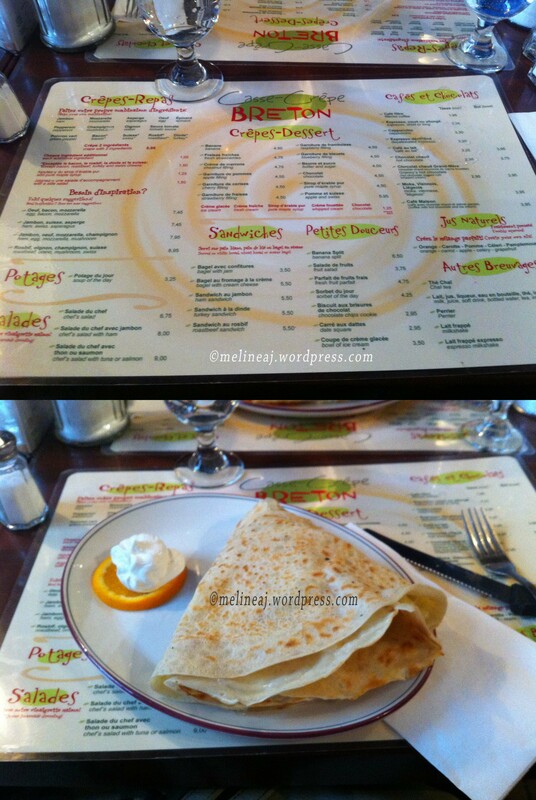 For the savory crepe, you can pick 2 ingredients for $6 or choose some suggestions in the menu. For me, the crepe was just okay *well, not my style of crepe*. The apple and swiss cheese combination were a bit odd for me but I managed to finish it all since I was starving – while my friend who ordered the same just left a big chunk. If you have any chance, try Paillard! My friend said the paninis were super delicious! We tried to go there twice but it was always too late at night. Breakneck Stairs overlooking Boulevard Champlain – picture doesn’t do justice… it was so pretty! esp. with the snow! 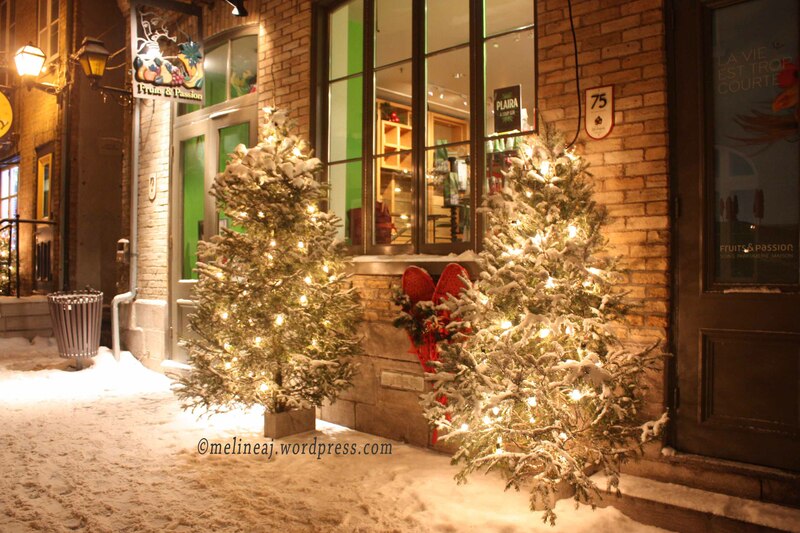 Anyway, as soon as I saw the Christmasy decor along the Petit Champlain, I forgot that rude woman hahaha… There were Christmas trees along this street which made it super Christmasy! And then I got a surprise to find a restaurant who serves everything rabbit in the menu called Le Lapin Saute! If you ask me if I was disgusted as a rabbit owner? Hm… my feeling was mixed… In one side, I just couldn’t imagine my rabbit on the plate as food; but on the other side, I really wanted to try the food – and yes, I think I ate rabbit satay many years ago since it was a common food in my home country. My friend and her family decided to eat at Le Lapin Saute while we kept going along the street since we weren’t that hungry. Later, my friend texted me that the food was really good! And when we decided to eat there for dinner, the restaurant declined us since it was fully booked! *bummer* Anyway, I forced my fiancee to take a lot of pictures of me in front of the restaurant hahahaha…. 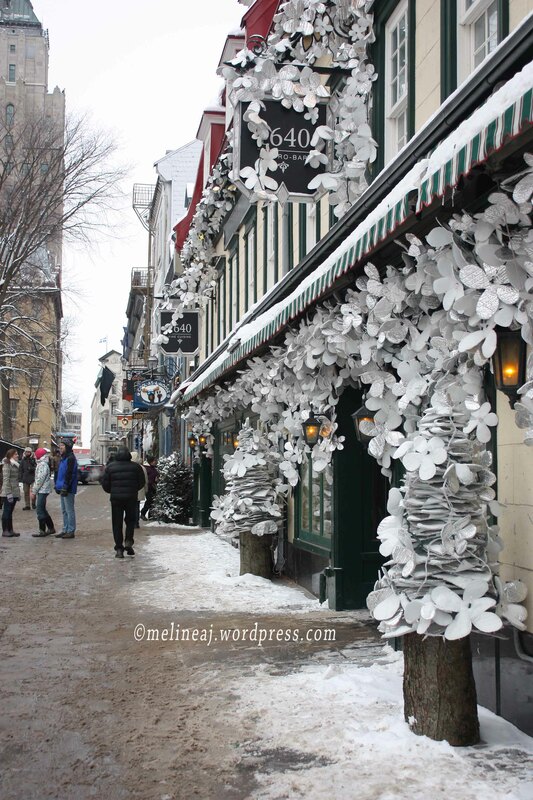 Rue Petit Champlain – the prettiest street shop! Le Lapin Saute is the bottom picture on the far left. While walking on this street, we saw a lot of people ate mapple taffy. 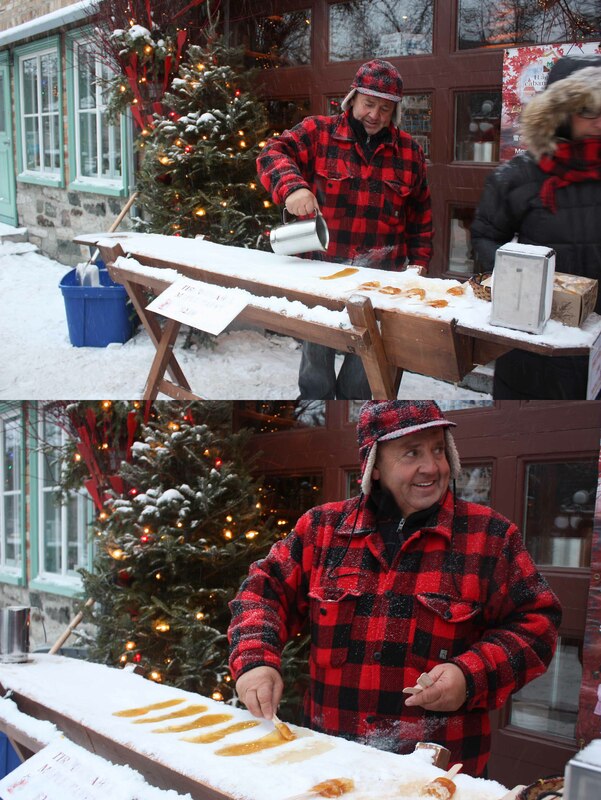 It is a Canadian sweets where the mapple syrup poured on top of the snow, rolled into a stick, and ate as lollipop. Again, I followed my instinct and found the shop just at the very end of the street. While I was doing research for the trip, I was obsessed to find store that sells mapple taffy and I was so happy that I found it! It was $2 for a stick. However, I was hoping that I could rolled the taffy by myself but the seller gave me the one that already rolled… A bit disappointed but it was not a big deal – because later, I would have a chance to do it in Montreal! YAY! The mapple taffy was SUPER good! It’s hard but once you put it in your mouth, it melts immediately. NYUM! 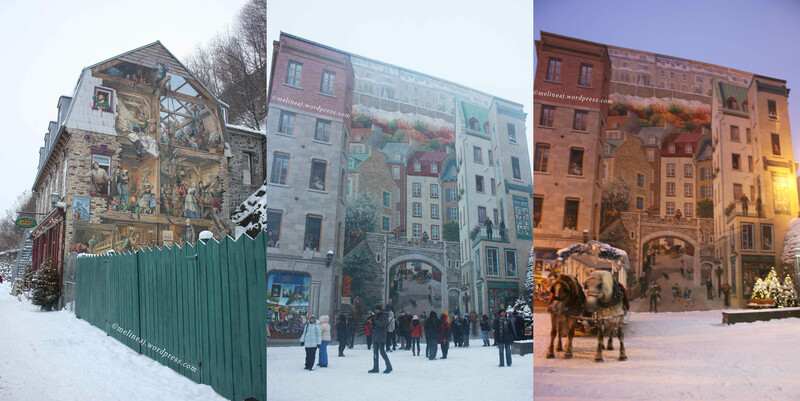 Beside the taffy shop, you can find the beautiful Petit Champlain Fresco. 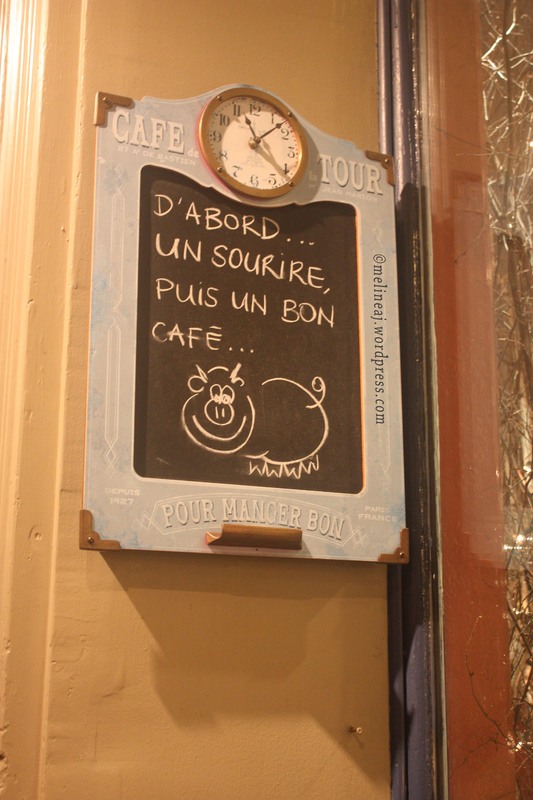 Cranky and hungry, we decided to have dinner at Le Cochon Dingue, the only restaurant that still opened at that time. The server was very nice, she asked us if we were able to finish in 1 hour since the table was actually booked. We said yes and promptly seated near the big window. 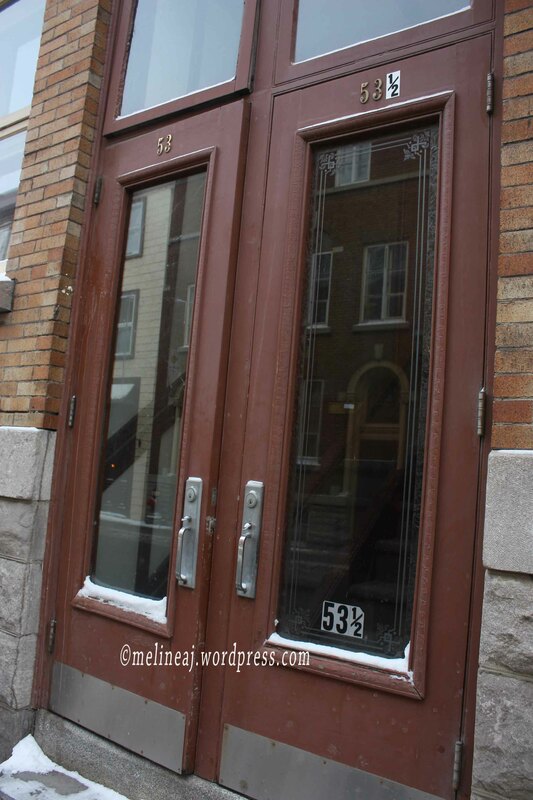 Little did we know, this restaurant was actually a highly rated one in Quebec City! We had no clue what we would eat. My brother ordered a bison burger, while me and my fiancee ordered a Christmas special – when we asked the server what the food was, she had difficulty to explain it and summarized that it was a Quebecois Christmas meal. 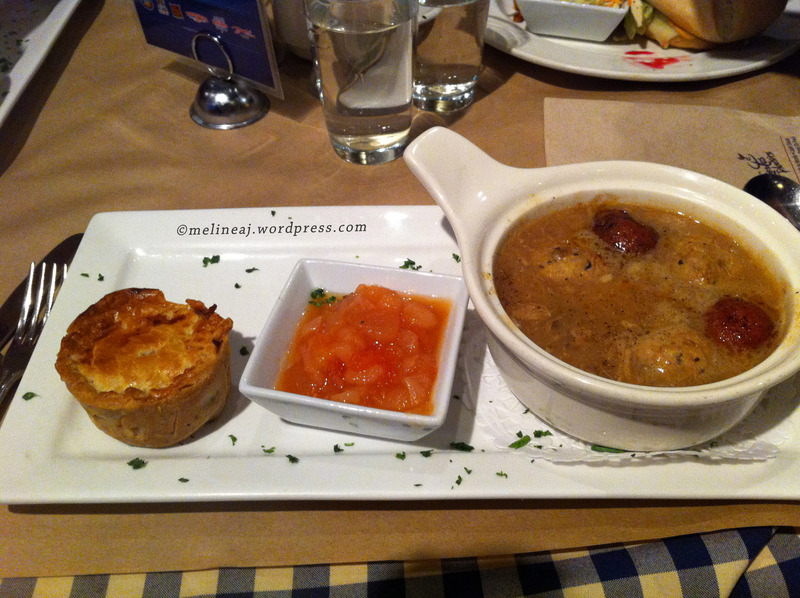 It turned out that it was a sort of meatball and potato stew served with sweet pickled fruit/ veggie and some sort of shepherd’s pie (see the picture below). I was afraid that the food wouldn’t be filling, but by the end of the meal, my stomach was stuffed! The service was very good. The food came only couple minutes after we ordered and the ambiance was warm and welcoming. 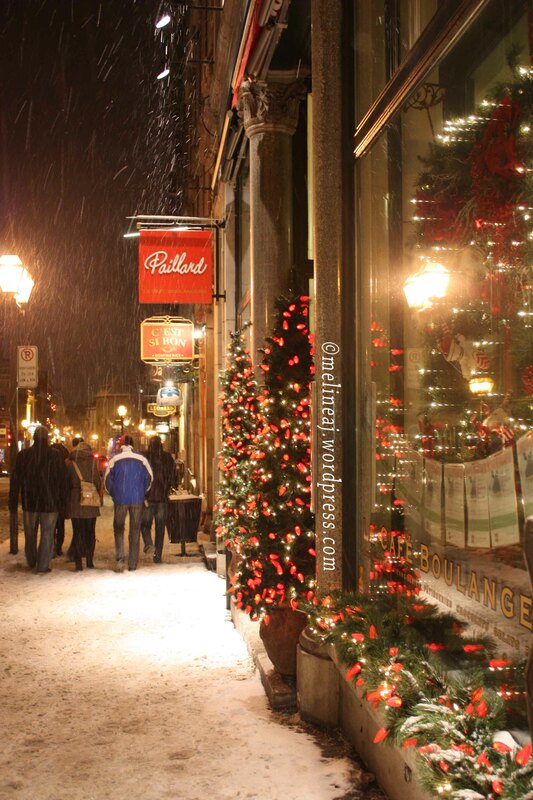 When we went out from the restaurant, it was already dark but it made Petit Champlain prettier with the little lights lit up! We took couple more pictures along this stunning street. It was just still around 8 pm when we got back to the hotel, yet we were super tired from walking all day. Me and my fiance rested a bit and decided that the night was still young. We then headed toward Place D’Youville. There was an outdoor mini skating area during the winter. Nearby, there are two theatres: Palais Montcalm and Capitol Theatre (the rounded building). We took some pictures here and there since there were nobody around during the late night Christmas day. You can see another gate, Porte St. Jean, as a part of fortification wall that marks the beginning of store and restaurant district on Rue St. Jean. My fiancee was hungry but all the places were already close so he bought a sandwich from this small convenience store on an alley. He said the sandwich was terrible hahahaha but at least he was full when he slept.